The nebula’s designation in the New General Catalogue is NGC 6514. The name Trifid refers to its three-lobed appearance. Messier 20 consists of several different objects: an emission nebula, a reflection nebula, a dark nebula and an open star cluster. Reflection nebulae, which typically appear blue in images, consist mostly of clouds of interstellar dust. They are also usually star-forming regions, but unlike emission nebulae, which emit spectral line radiation from ionized hydrogen, reflection nebulae do not emit any light of their own, but simply reflect the light of nearby stars. 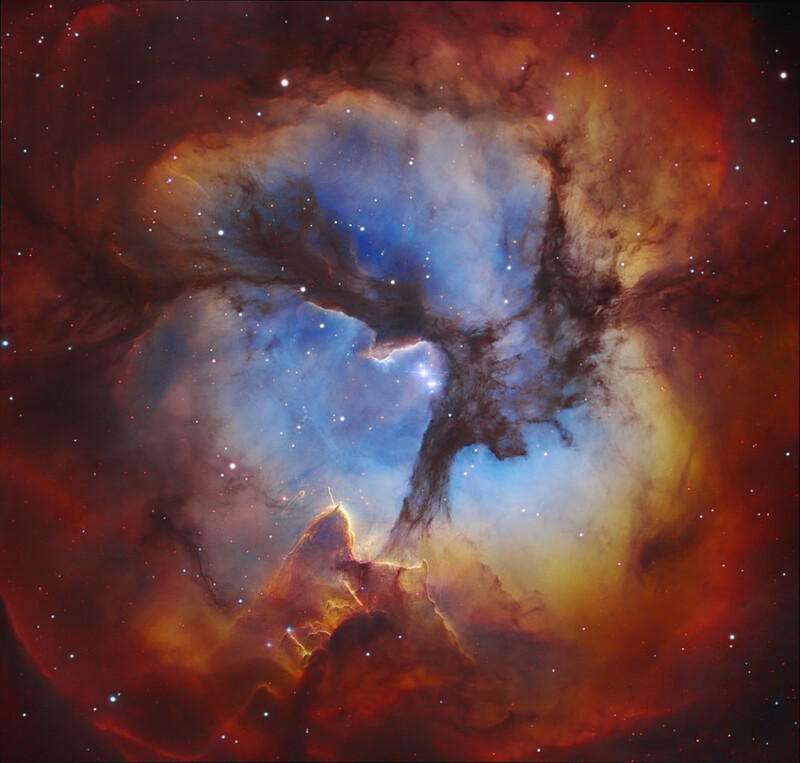 The Trifid Nebula can be found about 2 degrees to the northwest of the larger and brighter Lagoon Nebula (Messier 8) and appears in the same field of view as the open cluster Messier 21. 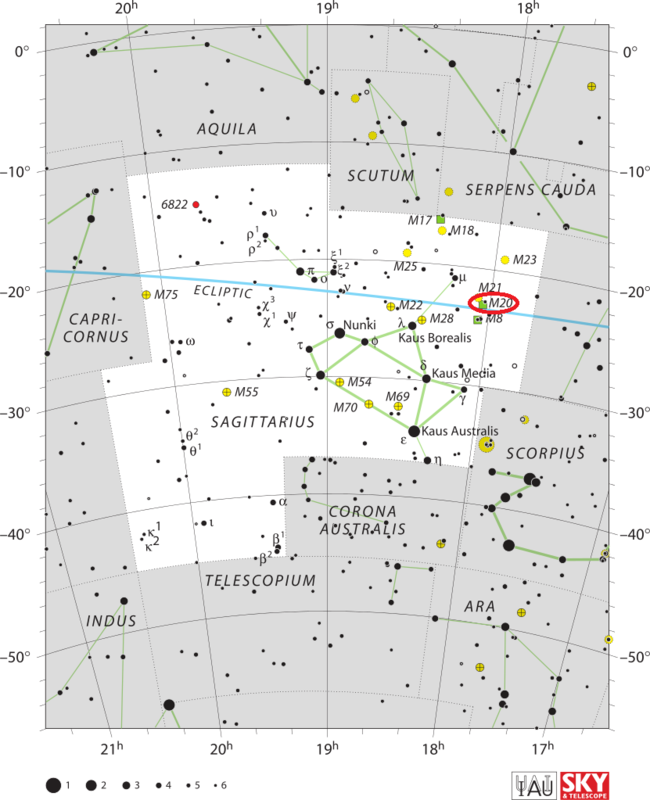 M20 can be located in the same way as the Lagoon, using the Teapot asterism in Sagittarius. It lies a few degrees to the west of Lambda Sagittarii, the star at the top of the Teapot. The larger Lagoon Nebula is visible to the naked eye on clear, moonless nights and the Trifid appears as a hazy patch of light only 2 degrees away. The open cluster at the centre of M20 is catalogued as C 1759-230. 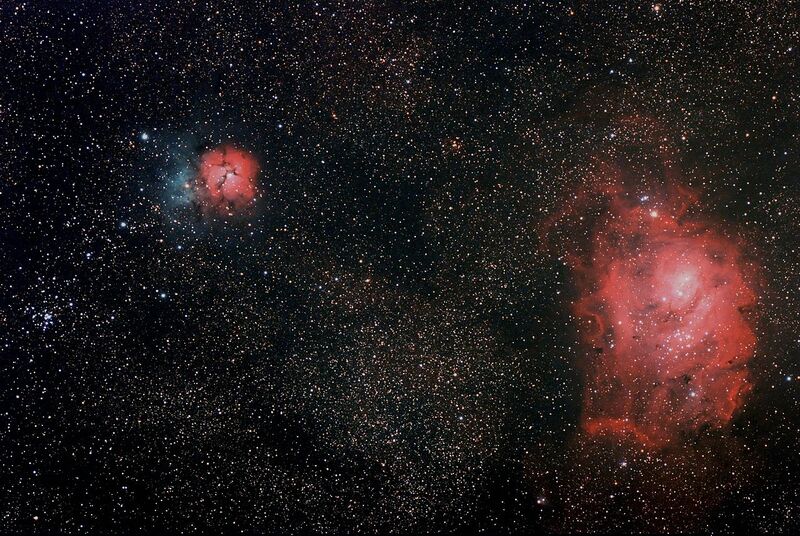 The cluster is surrounded by the red emission nebula which, in turn, is surrounded by the blue reflection nebula. The reflection nebula is particularly prominent in the northern part of M20. Messier 20 was famously photographed by the Hubble Space Telescope in 1997. The images revealed a dense cloud of gas and dust in the process of forming new stars. Many embryonic stars were found within the cloud, which lies roughly 8 light years from M20’s central star. The stellar jet protruding from the stellar nursery stretches across 0.75 light years. It is the radiation from the central star that makes the jet glow. An evaporating gas globule (EGG) was found in the vicinity of the jet. EGGs are knots of hydrogen gas, finger-like in shape and dense enough to prevent the star’s radiation from eroding the dust and gas in its path. Images taken by NASA’s Spitzer Space Telescope, an infrared space observatory, in January 2005 revealed 30 embryonic stars and 120 newly formed stars that had not been seen in visible light images of M20. Some of the stars found within the Trifid Nebula are only a few hundred thousand years old, possibly making the open cluster in M20 one of the youngest open clusters known. Some of the extremely young and massive stars that formed in the region may have already ended their lives in supernova explosions. These supernova events may be responsible for the appearance of the dust lanes in M20. This image composite compares visible-light views with an infrared view from NASA’s Spitzer Space Telescope of the glowing Trifid Nebula, a giant star-forming cloud of gas and dust located 5,400 light-years away in the constellation Sagittarius. Visible-light images of the Trifid taken with NASA’s Hubble Space Telescope, Baltimore, Md. (inside left) and the National Optical Astronomy Observatory, Tucson, Ariz., (outside left) show a murky cloud lined with dark trails of dust. Data of this same region from the Institute for Radioastronomy millimeter telescope in Spain revealed four dense knots, or cores, of dust (outlined by yellow circles), which are “incubators” for embryonic stars. Astronomers thought these cores were not yet ripe for stars, until Spitzer spotted the warmth of rapidly growing massive embryos tucked inside. The brightest star in the Trifid Nebula, designated HD 196692 (ADS 10991), is a triple star system composed of three extremely hot stars located on the west side of the open cluster. The three components have apparent magnitudes of 7.6, 10.7 and 8.7. The brightest of the three stars has a spectral type of O5 to O7. The system may contain additional, fainter components. Another extremely luminous star is found on the northern edge of the cluster. Designated HD 164514, the star is a white supergiant with the stellar classification A5 Ia. It has a visual magnitude of 7.42. A survey with the European Southern Observatory’s (ESO) VISTA telescope in 2015 revealed two entirely new categories of Cepheid variables stars, the first stars of this kind to be found in the centre of our galaxy. These stars exhibit variations in size and temperature and, as a result, their brightness changes over a period of about 11 days. The Cepheids only appear to be just behind M20, but are really located some 37,000 light years away, on the other side of the Milky Way. Messier 20 is difficult to see from locations too far to the north. The best time of year to observe it is in the summer months, when Sagittarius rises over the southern horizon in the evening. The nebula’s features can only be seen in large telescopes and the object itself doesn’t appear particularly notable in visible light. Edward Emerson Barnard catalogued the dark nebula in M20 as Barnard 85 (B 85). B 85 appeared on the list of Barnard objects in the first Barnard Catalogue of Dark Markings in the Sky, published in 1919. 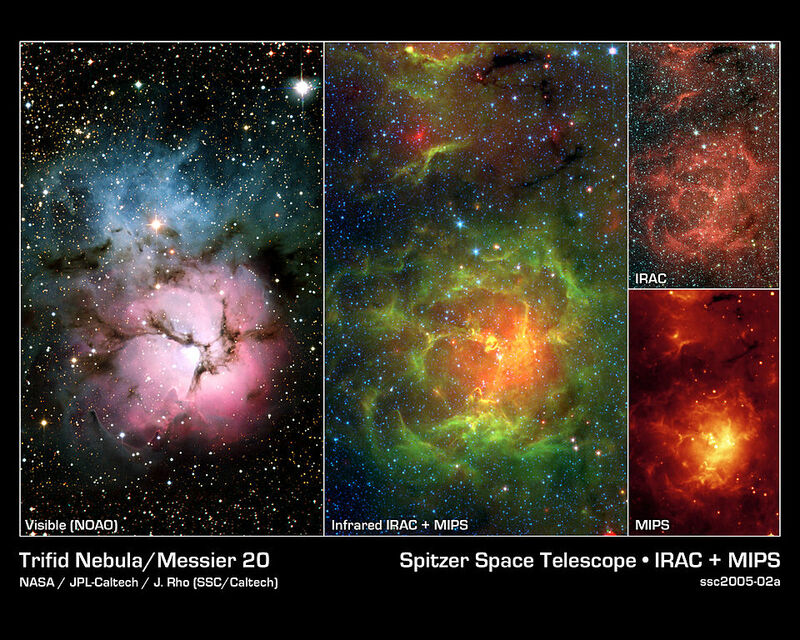 This image composite compares the well-known visible-light picture of the glowing Trifid Nebula (left panel) with infrared views from NASA’s Spitzer Space Telescope (remaining three panels). The Trifid Nebula is a giant star-forming cloud of gas and dust located 5,400 light-years away in the constellation Sagittarius. 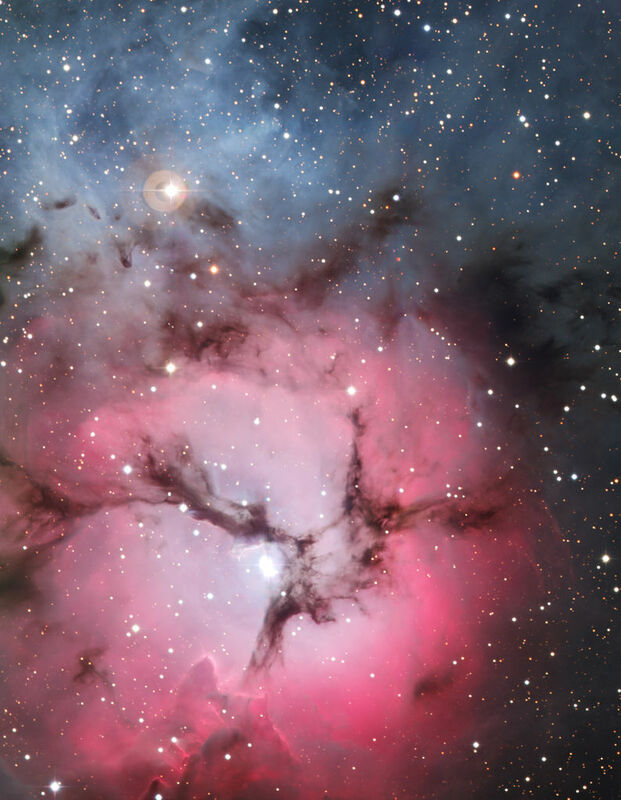 The false-color Spitzer images reveal a different side of the Trifid Nebula. Where dark lanes of dust are visible trisecting the nebula in the visible-light picture, bright regions of star-forming activity are seen in the Spitzer pictures. All together, Spitzer uncovered 30 massive embryonic stars and 120 smaller newborn stars throughout the Trifid Nebula, in both its dark lanes and luminous clouds. 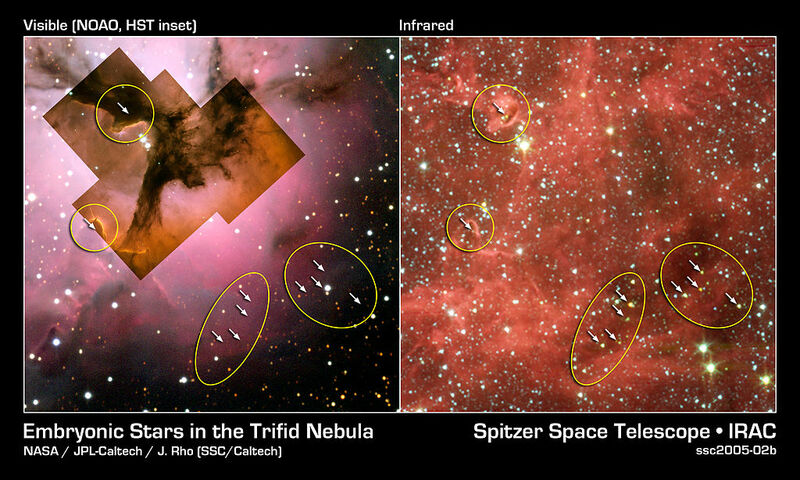 These stars are visible in all the Spitzer images, mainly as yellow or red spots. Embryonic stars are developing stars about to burst into existence. Ten of the 30 massive embryos discovered by Spitzer were found in four dark cores, or stellar “incubators,” where stars are born. Astronomers using data from the Institute of Radioastronomy millimeter telescope in Spain had previously identified these cores but thought they were not quite ripe for stars. Spitzer’s highly sensitive infrared eyes were able to penetrate all four cores to reveal rapidly growing embryos. Astronomers can actually count the individual embryos tucked inside the cores by looking closely at the Spitzer image taken by its infrared array camera (top right). This instrument has the highest spatial resolution of Spitzer’s imaging cameras. The Spitzer image from the multiband imaging photometer (bottom right), on the other hand, specializes in detecting cooler materials. Its view highlights the relatively cool core material falling onto the Trifid’s growing embryos. The middle panel is a combination of Spitzer data from both of these instruments.